In the hands of a skilled director, Triple Frontier proves greater than its macho exterior immediately suggests. J.C. Chandor has quietly established himself adept as a director of reserved, tightly-made thrillers of varying flavour. His films often circle around the theme of survival against the odds, whether that be through Robert Redford’s quite literal struggle against the elements in All Is Lost or Oscar Isaac’s tussle with underhand business tactics in A Most Violent Year. His latest feature, Triple Frontier, proves no exception in its focus. With a screenplay co-written by Chandor and Zero Dark Thirty‘s Mark Boal, the film is far more perceptive than its testosterone-fuelled marketing may have you believe. Sure, there are guns aplenty, but Triple Frontier just barely qualifies as a shoot-’em-up – Chandor’s interest here is in the men doing the shooting, and why. The director’s outwardly traditional portrayals of masculinity tend to reveal a deeper assessment of the ‘manly’ man. In this case, it’s an examination of the tribal bond formed between soldiers. Touching on the abandonment of veterans in the aftermath of military service, Triple Frontier‘s ensemble represents the general malaise that seems to face those who come home from conflict. Despite appearances, it could be read as less decidedly pro-military, more pro-vet support, an indictment on a system that chews up and spits out these men (and women) with little care to their long-term stability. Re-teaming with Isaac, Chandor also lines up Ben Affleck, Charlie Hunnam, Garrett Hedlund and Pedro Pascal in his contemporary band of brothers. A gentle sadness is ubiquitous amongst them, most thoroughly captured by Affleck’s Tom. Codename Redfly, Affleck’s strategist and de facto leader of the pack finds himself struggling with money, a failing estate agent in the midst of a divorce and growing distant from his teenage daughter. Considering the actor’s recent real-life troubles, you get a painful sense that this role wasn’t too much of a reach. When Isaac’s Santiago comes to him with a job that could bag them millions (hundreds of millions) and bring down a notorious drug lord in the Amazon, Tom’s initial reluctance is too easily worn down. Once he gets his eyes on their potential bounty, he’s a man possessed. Whatever the inspiration, Affleck sells the growing desperation effectively, right up until the bitter end. With a Narcos-esque opening that gets through the basic set-up, the film rapidly builds to its heist within the hour, zipping through the preparations at a disarming rate. The audience is lulled into a false sense of security before cracks start to show in an ostensibly solid plan; soon, navigating their way out of South America with that much cash in tow becomes an increasingly tricky ordeal. 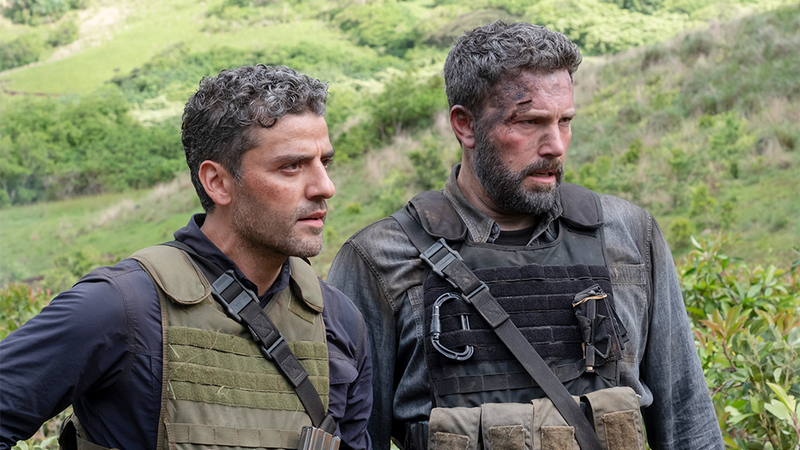 Rather than ratcheting up to a crescendo of dread, Triple Frontier slows down in its later half. Danger bubbles under the group’s slow escape across the Andes. Chandor’s staging is effectively low-key and withholding, so when things truly get deadly it feels more true to life. We know from the get-go that this plan will not go off without a hitch, with the compelling drama coming in the ways its failure continues to exacerbate. One scene raises a whole load of moral quandaries, with Tom and Santiago confronting a crowd of rural villagers as they try to retrieve some of the cash gone astray, a delicate situation that turns south quick. It’s the most challenging in the film, and evidence alone that Triple Frontier is a cut above your average action thriller. Though not particularly hampered by its landing on Netflix, Triple Frontier’s panoramic vistas would certainly look good up on the big screen. But this is no Mad Max: Fury Road. Aside from the central heist, the film’s action should not be considered its biggest draw. It can be shaky at times, with the closing car chase underwhelming and somewhat anticlimactic. This fits with Chandor’s aesthetic of restraint, however flimsy that justification sounds. The coda, mind, is a real doozy. At first despondent, the final scene won’t have you baying for a sequel. Instead, in a state of grin-inducing satisfaction, knowing that some good may come of all the bloodshed after all. Triple Frontier (2019), directed by J.C. Chandor, is distributed in the UK by Netflix, certificate 15.